For a given size motor, the larger the rotor the greater the torque. 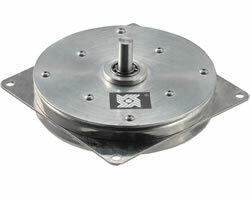 Haydon Kerk provides an advanced, compact, low profile pancake stepper motor with a specially engineered, rotor-embedded, single-stage planetary gear train... designed to meet or exceed your most demanding small space high-torque applications. This motor has a maximum diameter of 3.15-in (80mm) and is .75-in (20mm) thick.